YAPC: :Asia starts on August 20th with "day zero," with a talks that didn't make the main two days. I probably won't be there for much of that, since it's mostly Japanese content. Despite two prior YAPCs in Tokyo, I still can't understand Japanese. Go figure! It's Tuesday the 18th, for me, and I'm headed to Tokyo, where I'll arrive on the 19th. Time zones, man. I'll write up the conference after it's over, but I thought I'd kill some time on the plane by writing up the trip so far. It has been some good travel! Last night we watched two episodes of Scream (so far: it's okay). Got to bed around eleven, with my alarm set for 4:45. As usual, because I knew I had to get up early, I slept terribly, waking up again and again, wondering whether I had overslept. (This was silly, Gloria would have made sure I got up, but it wasn't under my control!) I got a quick shower, did my last minute packing, and we were out the door. We stopped at Wawa and I got a breakfast sandwich on cinnamon French toast. American breakfast is a fine thing. The bus ride was uneventful. I played some Animal Crossing. I finally had to get a haircut. I had to take the 5:20 bus to get to Newark on time, but that got me there almost three hours early. Security for Terminal A was the longest I have ever seen. That killed some time. I dozed a little. I played a little Minecraft with the kid. Mostly, though, for two hours, I walked back and forth through the food court, scowling at the ridiculous airport prices. Seven dollars for a soft pretzel! I showed them, though. I didn't buy a thing! That'll teach'm. The flight to Toronto was short and uninteresting. They offered a free snack: two lemon crackers. I'd have scowled at that, too, but they were pretty good. At YYZ, I had to go through customs, even though I wasn't planning to leave the airport. Nothing surprising there, but after customs, I had to walk down a long corridor, passing above the food court. I began to think I'd have to wait to eat on my flight… but then I saw the Air Canada lounge. I'm gonna go ahead and say it: the Maple Leaf Lounge in YYZ terminal E is my new favorite lounge. I had some pho and two gin and tonics (and some other stuff). It was big and roomy and clean and modern and I would not mind getting stuck there for a couple hours sometime. When I went to board, the gate agent took away my boarding pass and vanished for a minute. When she came back, she handed me a new crisp boarding pass. "Complimentary upgrade today, sir." I can't remember the last time I flew business class, but it's been over ten years, and it wasn't as nice as this seat. It's a recliner, it's comfortable, and it has the best adjustable foot rest I've ever seen. The seat next to me is empty. Then! Then! I poked around the in-flight entertainment system — which, by the way, is a heck of a lot better than that crap they give you in coach — and there was a documentary about A Tribe Called Quest. I watched that and then I ate some steak. Hopefully on the rest of the flight I'll get some work done and get some sleep. I've got this fantasy idea that I'll adjust in-flight to Tokyo time. Probably not, but trying will give me something to do. I think that ATCQ documentary was the only movie on the list that I'd want to watch without Gloria. Shortly after arrival in Narita, I met up with Casey West, his girlfriend Manda, and his former co-worker Marylou. We'd originally planned to make most of the trip into the city together, but when the dust settled, Casey and Manda were gone. I promised to help Marylou find her hotel, but this required first getting to my hotel where my wifi hotspot was waiting for me. This wasn't too difficult, but my hotel turned out to be more of a walk from Shinjuku station than I'd expected, and we were both pooped. Only through the strange reserves of strength that show up after 36 hours of wakefulness (plus a plate of sushi) did I stay awake long enough to get her to Ariake and then me back to Shinjuku. 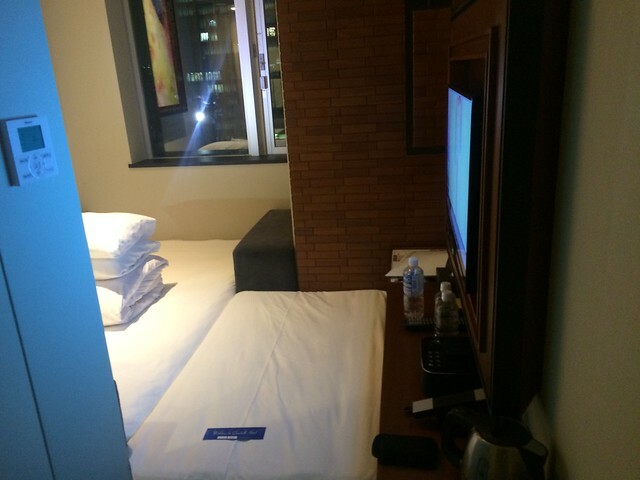 I stayed at the Shinjuku Granbell, and my room was absolutely tiny. I was surprised by how much I enjoyed that. The bed was comfortable (and very, very firm). The water pressure was high. The smallness seemed to say, "Get out of here and do something else." This photo does not do justice to its size.